I obtained a number of Siberian Elm burl logs by bartering with a local chain-saw carver. Siberian Elm, as strange as the name sounds, is a species that has commonly been planted in Pennsylvania as an ornamental specimen tree to replace the American Elm that was decimated by Dutch Elm disease. When I started working with this particular log, I knew at what position and angle of grain I wanted to place it on the lathe. Thus - if my intentions materialized - the natural edge of the log where a large burl was concentrated would become the opening of a large vase. What wasn't exactly known was how magnificent this winged piece would look like in the end! 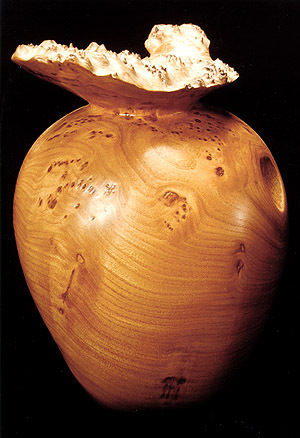 It was hollow-turned to incorporate both the large burl (knobby top) and a deep natural cavity on the side, as well as the striking grain pattern. Titled "Wood Don't Fly", this piece received the "Best Of Show" award at the 1995 Pittsburgh Craftsman's Guild Annual Exhibition.